Albert Einstein, German-born American physicist and Nobel laureate, best known as the creator of the special and general theories of relativity and for his bold hy­pothesis concerning the principle nature of light. He is perhaps the most well-known scientist of the 20th century. Einstein was born in Ulm on March 14, 1879, and spent his youth in Munich, where his family owned a small shop that manu­factured electric machinery. He did not talk until the age of three, but even as a youth he showed a brilliant curiosity about na­ture and an ability to understand difficult mathematical concepts. At the age of twelve he taught himself Euclidean geometry*. *Euclid (c 330-c 260 BC) — Greek mathematician who wrote the Stoicheia Elements in 13 books, nine of which deal with plane and solid geometry and 4 with nuclear theory. Einstein hated the dull regimentation and unimaginative spirit of school in Munich. When repeated business failure led the fam­ily to leave Germany for Milan, Italy, Ein­stein, who was then 15 years old, used the opportunity to withdraw from the school. He spent a year with his parents in Milan, and when it became clear that he would have to make his own way in the world, he fin­ished secondary school in Arrau, Switzer­land, and entered the Swiss National Poly­technic in Zurich. Einstein did not enjoy the methods of instruction there. He often cut classes and used the time to study phys­ics on his own or to play his beloved violin. He passed his examinations and graduated in 1900 by studying the notes of a class­mate. His professors did not think highly of him and would not recommend him for a university position. For two years Einstein worked as a tutor and substitute teacher. In 1902 he secured a position as an examiner in the Swiss pat­ent office in Bern. In 1903 he married Mileva Maric, who had been his classmate at the polytechnic. In 1905, Einstein received his doctorate from the University of Zurich for a theo­retical dissertation on the dimensions of molecules, and he also published three the­oretical papers of central importance to the development of 20th-century physics. Ein­stein made significant predictions about the motion of particles that are randomly dis­tributed in a fluid. These predictions were later confirmed by experiment. The second paper, on the photoelectric ef­fect, contained a revolutionary hypothesis concerning the nature of the flight. Einstein, whose prime concern was to un­derstand the nature of electromagnetic ra­diation, subsequently urged the development of a theory that would be a fusion of the wave and particle models for light. Einstein’s third major paper in 1905, “On the Electrodynamics of Moving Bodies”, con­tained what became known as the special theory of relativity. Since the time of the English mathematician and physicist Sir Isaac Newton, natural philosophers (as phys­icists and chemists were known) had been trying to understand the nature of matter and radiation, and how they interacted in some unified world picture. The position that mechanical laws are fundamental has become known as the mechanical world view, and the position that electrical laws are fundamental has become known as the elec­tromagnetic world view. Neither approach, however, is capable of providing a constant explanation for the way radiation (lights, for example) and matter interact when viewed from different inertial frames of reference, that is an interaction viewed si­multaneously by an observer at rest and an observer moving at uniform speed. In the spring of 1905, after considering these problems for ten years, Einstein realized that the crux of the problem lay not in a theory of matter but in a theory of measurement. At the heart of his special theory of relativ­ity was the realization that all measurements of time and space depend on judgements as to whether two distant events occur simul­taneously. This led him to develop a theory based on two postulates: the principle of relativity, that physical laws are the same in all inertial reference systems, and the principle of the invariance of the speed of light, that the speed of light in a vacuum is a uni­versal constant. He was thus able to provide a consistent and correct description of phys­ical events in different inertial frames of reference without making special assump­tions about the nature of matter of radiation, or how they interact. Though many scientists did not understand Einstein’s arguments, he had important supporters, however, his chief early patron was the German physicist Max Planck*. *Planck, Max (1858-1947) — a German scientist who devel­oped the ideas on which Quantum theory is based. Ein­stein remained at the patient office for four years after his star began to rise within the physics community. He then moved rapidly upward in the German-speaking academic world; his first academic appointment was in 1909 at the University of Zurich. In 1911, he moved to the German-speaking university at Prague, and in 1912 he returned to the Swiss National Polytechnic in Zurich. Finally, in 1914, he was appointed director to the Kaiser Wilhelm Institute for Physics in Berlin. Even before he left the patent office in 1907, Einstein began work on extending and gen­eralizing the theory of relativity to all ex­tending and generalizing the theory of relativity was not published until 1916. In this theory the interactions of bodies, which heretofore had been ascribed to gravitational forces, are explained as the influence of bodies on the geometry of space-time. On the basis of the general theory of rela­tivity, Einstein accounted for the previous­ly unexplained variations in the orbital motion of the planets and predicted the bending of starlight in the vicinity of a massive body such as the sun. The confir­mation of this latter phenomenon during an eclipse of the sun in 1919 became a me­dia event, and Einstein’s fame spread world­wide. For the rest of his life Einstein de­voted considerable time to generalizing this theory even more. Most of Einstein’s colleagues felt that these efforts were misguided. Between 1915 and 1930 the mainstream of physics was in de­veloping a new conception of the fundamen­tal character of matters known as quantum theory. After 1919, Einstein became international­ly renowned. He received honours and re­wards, including the Nobel Prize in physics in 1921, from various world scientific soci­eties. His visit to any part of the world be­came a national event; photographers and reporters followed him everywhere. When Hitler came to power, Einstein imme­diately decided to leave Germany for the United States. He took a position at the In­stitute for Advanced Study at Princeton, New Jersey. In 1939, Einstein collaborated with several other physicists in writing a letter to President Franklin D. Roosevelt, point­ing out the possibility of making an atomic bomb and the likelihood that the German government was embarking on such a course. The letter, which bore only Einstein’s signature, helped lend urgency to efforts in the United States to build the atomic bomb, but Einstein himself played no role in the work and knew nothing about it at the time. 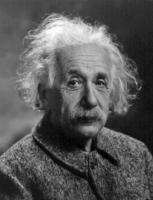 After the war, Einstein was active in the cause of international disarmament and world government. In the United States during the late 1940s, and early 1950s he spoke out on the need for the nation’s in­tellectuals to make any sacrifice necessary to preserve political freedom. Einstein died in Princeton on April 18, 1955. Einstein’s efforts in behalf of social causes have sometimes been viewed as unrealistic. In fact, his proposals were always carefully thought out. Like his scientific theories, they were motivated by sound intuition based on a shrewd and careful assessment of evidence and observation. Although Edi­son gave much of himself to political and social causes, science always came first, because, he often said, only the discovery of the nature of the universe would have lasting meaning.